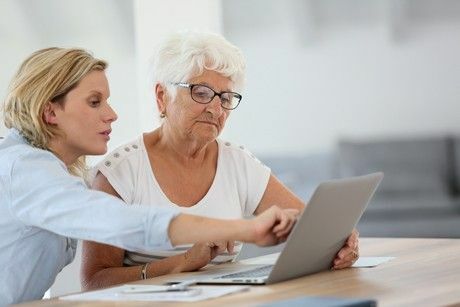 Preparing your taxes can be confusing and stressful for many of us, but consider the stress of untangling complicated finances for your elderly parent. Your mom may have filed her own taxes for her entire life. She may not feel like she needs help. But if she is confused, or you don’t believe she has a handle on her personal finances, you may need to step in and persuade her to get help. Trust us; it’s better to do this now than to deal with the IRS later! Many important and necessary documents for taxes, from investment income to social security statements, will be mailed to your parent’s home. Make sure these items are received and placed in a safe spot. Encourage your mom to add received tax documents into a single, dedicated folder or large envelope. Half the battle will be knowing what to look for and making sure that she has all her documentation together. You may have the best of intentions, but understanding your parent’s financial situation regarding deductions, exemptions, credits, and how these apply can be terribly confusing. Tax professionals can be a tremendous asset to help you evaluate types of income, and any changes in tax laws. Money can be lost for not claiming the appropriate credits and deductions that they might be entitled to. Hiring a professional may be exactly the help that you need. Another way to help your parent is to remind them of their high risk of tax scams. The elderly are more vulnerable to these type of nefarious scams and identity fraud because they can be overly trusting and sometimes easily persuaded. For tips on how your loved one can protect themselves or how to handle unwanted phone calls, check out our articles on How to Avoid Tax Scams. In some cases, if your senior loved needs assistance with their taxes, AARP Foundation Tax-Aide may be able to help. Since 1968, this volunteer-based program has assisted nearly 50 million low- to moderate-income taxpayers. This team of volunteers offers free tax preparations for those 50 years and older who can’t afford to hire a tax preparation service. These IRS-certified volunteers are trained to handle the complicated issues with retirement and life changes of the elderly. With over 5,000 locations, AARP Foundation Tax-Aide can be found at local senior centers, malls, libraries, and community centers across the country. AARP membership is not required. There is no fee. Find out if your parent might qualify at www.aarp.org. Taxes can be very confusing for. For more information and tips for seniors in preparing their tax returns, visit the official IRS website. If you’re looking for a referral for a CPA or tax professional contact the Aegis Living community near you and ask our Marketing Director for a recommendation.